Fleas are annoying, aren't they? They bite and make you itch. If you have a dog, which fleas love, they are irritating your dog too. Therefore, if you have a flea problem, you are probably seeking a way to get rid of the fleas. You might want a natural solution that is not harmful to you or your pets. Fortunately, there are answers. Here, we will look at natural solutions for getting rid of fleas from your house and pets. Many insects, including fleas, can be killed with dish soap. So, your flea trap will have to involve liquid dish soap and something to attract the fleas. They are attracted to light. Place the plates or bowls in each room of the house at night. Fill the plates with warm water. Fill the bowls only halfway with the warm water. Put a generous amount of dish soap in each plate and bowl. Place a tea candle in the center of each plate and light it. 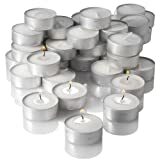 For the bowls, you'll have to place candles very near the bowls. The fleas will be attracted to the light, jump for it and get stuck in the soapy water and die. 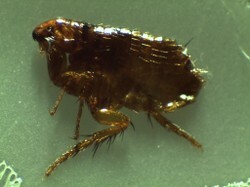 Like a lot of insects, such as cockroaches, and bed bugs, fleas have exoskeletons. Diatomaceous Earth is like tiny shards of glass that sink past these insects' exoskeletons to penetrate their bodies and drain them of their fluids and dehydrate and kill them. Good thing is, Diatomaceous Earth is totally non-toxic to people and pets. Therefore, you can sprinkle it wherever you think the fleas will go and leave it there for a day or two. Then vacuum it up along with the dead fleas. Dogs don't like fleas but they'd like for you to get rid of them. As stated, dish soap kills fleas. Giving your dog a bath in dish soap will get rid of them and give your dog some quick relief. Oatmeal. Soak the oatmeal in water until it softens up and then rub it on your dog. Let it sit for ten minutes then rinse it off of your dog. Home-made flea collar. Use a bandana and put several drops of cedar or lavender oil mixed with 3 tablespoons of water on it. Tie it around your dog's neck. Apply once a week. Anti-flea drink. Use a teaspoon of apple cider vinegar and a quart of water and let your dog drink it. Anti-flea sprays. You can use a few drop of the lavender or cedar oil along with a cup of vinegar and a quart of water and put it in a spray bottle and spray your dog with it. Fleas hate it. Lemon comb. Slice a lemon and boil a pot of water. Put the lemon slices in the water and turn off the heat, cover the mixture and let it sit overnight. In the morning, dip a comb in the solution and comb your dog's hair with it. This mixture can also be made into a spray. Add some mint or orange slices to the mixture; fleas, like many insects, are repelled by mint and citrus. Any mixture of eucalyptus, cedar, lemon grass, rosemary and marigold will repel fleas. If you leave an open jar of eucalyptus leaves in your home, it will chase away the fleas. So, there you have it. There are natural remedies for getting rid of fleas in your home and to give your dog relief too. One thing is for certain: You will be happier without those tiny little pests harassing you and your canine companion again. What a wonderfully educational article! I wonder about using some of the mixtures for putting on dogs for cats? Guess I need to research if cats will tolerate those ingredients, since, unlike dogs, they are always licking their fur. Natural flea remedies work so well. If people only knew, they'd probably stop using those chemical flea treatments. Interesting, Pam. I've heard that borax is effective against fleas. I've always used borax to get rid of fleas in the carpet. It works great. Cool, Candy. Good to hear that a home remedy got rid of the fleas. These are all great home remedies for fleas. When my cat had fleas I cut some fresh rosemary and brushed her with it. She loved the feeling and it got rid of the fleas. It really does work!